Last year’s NVIDIA GeForce GTX 1080 flagship was certainly an impressive display of strength in terms of performance, power and thermals, especially considering it was the first outing using TSMC’s new 16nm FinFET manufacturing and virtually zero competition from AMD at the time (and still is true to date sadly). However, it also set a worrying trend in terms of price / performance. What should have been priced as a ‘high end’ card was actually priced in the same ball-park as Maxwell’s generation top-tier card – the NVIDIA GeForce GTX 980 Ti (assuming we exclude the Maxwell 2015’s Titan X from the comparison). More worryingly, the performance increase was ‘only’ being around 30% faster which, in the past, had been more a ‘given’ that you would get this type of performance improvement without additional cost over the previous generation. In the UK, the triple-whammy of the traditional ‘UK GPU tax’ (a fun but true joke than the dollar value of a GPU never equates to the pound exchange rate once it reaches UK shores), falling value between the pound against the dollar and total lack of competition from AMD in the high-end GPU sector of the market saw prices hit an absolutely staggering £650 ball-park. 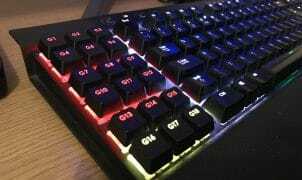 For the sake of the PC gaming and the enthusiast community, I sincerely hoped this would be a ‘one-off’, however, it wasn’t before long my fears were set to continue. Enter 2017 and not too long into the new year, towards the end of February, the NVIDIA GeForce GTX 1080 Ti was launched. 3584 CUDA cores, 11GB of GDDR5X memory rated at 11Gbps, 35% faster than the GTX 1080, faster than the Titan X – all for only £650-700 here in the UK? Well it isn’t exactly in the realm of ‘cheap’ but we have now left insanity central and we’re back on the road going someway back towards ‘normalville’ especially considering this the Ti model and in the ‘best of Pascal’ arena. This is a card whose price / performance combination gets me pretty excited even as an AMD fan and is seriously tempting me back to the dark…. I mean …. green side. 3584 CUDA cores, 11GB GDDRX @ 11Gbps and only £650? Yes – there’s a lot to be excited about Mr Huang! AMD please take note – this is how it is done! So of course this brings us to the topic of this article. With every GPU worth its salt, a plethora of aftermarket releases with improved feature sets, cooling, performance and aesthetics – MSI Gaming X, EVGA Superclocked, Zotac AMP!, Palit JetStream – everyone has their favourite 3rd party brand. 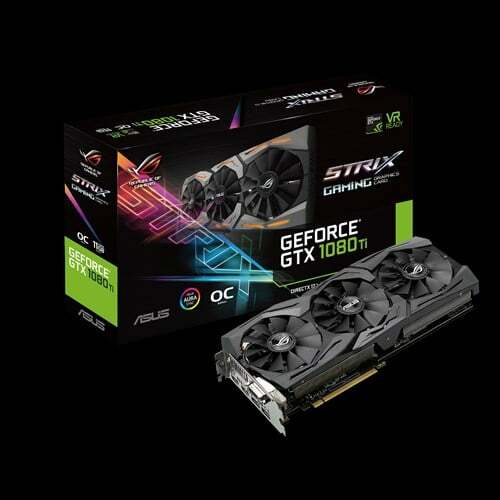 However, few aftermarket cards are as highly anticipated as the ASUS ROG Strix releases – well known for some of the best consistent clock rates, coolest operation and whilst being whisper quiet operation thanks to the enhanced aftermarket cooling solutions and featuring some of the best RGB lighting on the market. Introducing the ASUS ROG Strix GeForce GTX 1080 Ti OC Edition – possibly one of the most anticipated aftermarket GTX 1080 Ti’s that we’re sure many folks will consider investing in.